Texas is a big state with varied climates and rainfall. A common feature is the hot, intense summer, which can be tough on tomato plants. For ease of maintenance and higher success with bountiful yields of the tasty red fruits, Texas Gardener Magazine suggests focusing on six key areas when planting tomatoes in your region of the Lone Star State. Good preparation and knowledge before planting tomatoes can reduce seasonal ailments and the need for chemical pest control. Tomato plants appreciate fertile soils and grow best in a moist, well-draining soil that is rich in organic matter like compost or well-cured animal manure. Loose sandy soils and heavy clay soils need considerable amending with organic matter to improve fertility or water drainage. Texas Gardener recommends adding several inches of organic matter to your garden soil regardless of its makeup, and Texas A&M University suggests incorporating it to a depth of at least 6 inches. 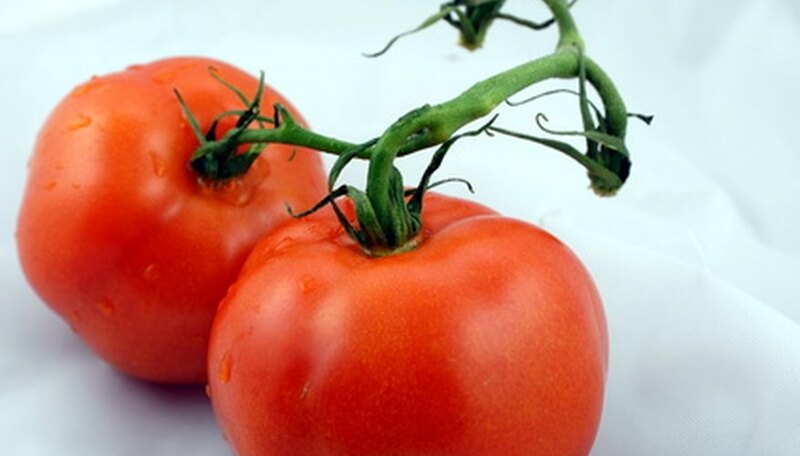 Tomatoes should be located where a minimum of six hours of direct sunlight reaches their leaves each day. Too little sunshine reduces plant vigor and growth and delays or reduces flowering. While Texans can grow both large and small tomato varieties, Texas Gardener Magazine encourages you to look for quick-maturing varieties. The maturity dates are listed on plant labels at nurseries, telling you how many days it takes for the tomato variety to produce mature fruits. Texas has a short growing season for tomatoes from the last frost of winter to the hot weather of summer. Once daytime temperatures reach the 90 degree F range and nighttime temps drop no lower than 70, tomatoes will start aborting their flowers, resulting in fewer fruits. This is more pronounced on larger fruited varieties than on cherry tomato types. The goal is to get as many tomatoes growing and set on plants as possible before the intensely hot weather arrives. Transplant tomatoes only after the danger of spring frosts has fully passed. Seeds can be started indoors eight to 12 weeks before this last expected frost date. In southeastern Texas, it is possible to transplant tomatoes in late summer about 100 days before the expected first fall frost date. The opportune time for tomatoes is when temperatures are between 75 and 85 degrees during the day and between 60 and 70 degrees at night. Texas A&M University suggests transplanting tomato plants into your garden plot in the early evening or on cloudy days to reduce stress on them. Planting in early morning or midday exposes them prematurely to intense heat and sunlight, increasing need for watering. Plant tomato plants deeply in the soil so that 80 percent of the stem is below ground. This increases root growth and gets plants off to a better start. If your tomato is a vine (indeterminate) or large bush (determinate) type and you expect to need stakes, place a wire or wooden trellis cage over the plants within two weeks of planting to reduce any piercing damage to the roots. This also avoids breaking stems or having to lift and maneuver branches into the cage system if plants are too large. Providing good air circulation around tomato plants and reducing the splashing of soil onto stems and leaves can reduce plant diseases. Space plants no closer than 3 feet apart for cherry types and between 4 and 5 feet for larger bush or vining types. This allows for good air flow around plants, reducing fungal concerns. Once the soil is warmed up in mid- to late spring, scatter a 2- to 3-inch layer of hay, compost or dried leaves under the tomatoes to keep stems and leaves out of direct contact with the soil surface. Keep the mulch about 3 inches away from the main stem.